A new study by University of Alberta biologists shows black bear populations are lowest on Crown land and most dense on national park land, followed by private land, highlighting issues for management and conservation efforts. "We might have thought that Crown land would host more black bears," said ecologist Mark Boyce. 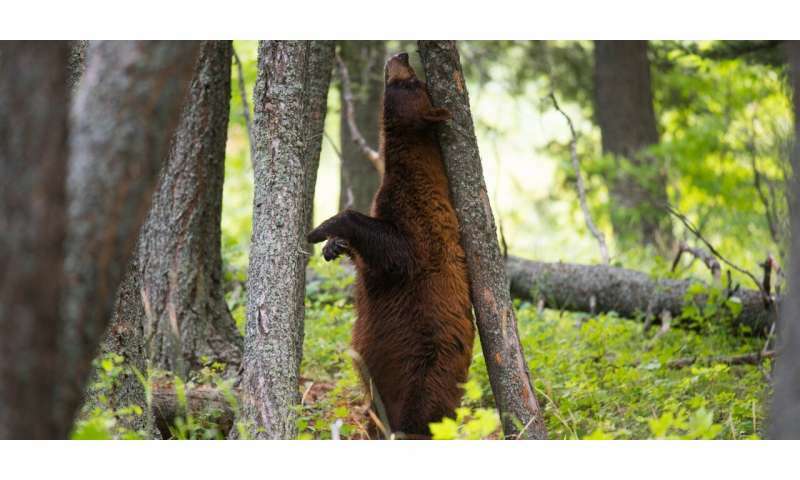 "However, many bears appear to have been displaced onto private lands, likely due to excessive use of Crown land for recreation, like quadding, camping and motorbiking." In the study—the first comprehensive analysis of the black bear population in Alberta in more than 30 years—researchers used bear hair samples collected from trees, power poles and fences to identify individuals by DNA and then estimate population size. "There are a number of possible reasons why density differs by land tenure, such as mortality risk from humans and the availability of foods," said Annie Loosen, who recently completed her master's degree under Boyce's supervision. "Private lands in our study are mainly agricultural lands, which can also be attractive to black bears, especially stored and standing grain," she added. "In Alberta, this is particularly problematic because landowners can hunt or give other hunters permission to shoot a black bear on their land at any time of year without restriction." The findings support recent decisions limiting off-highway vehicle use in Castle Provincial Park and Castle Wildland Provincial Park, explained Boyce. "Our results reinforce the decision to protect core habitats in provincial parks. We are keen to learn the response by both grizzly bears and black bears to increased protection on Crown land." The researchers also recommended ongoing monitoring of black bear populations to document the outcomes of policy changes. The study, "Land Tenure Shapes Black Bear Density and Abundance on a Multi‐use Landscape," was published in Ecology and Evolution.